1. Trust Establish relationships with society, customers, shareholders, employees, and business partners based on strong mutual trust and respect. 2. Quality Provide the best products and services with unsurpassed quality. 3. Technology Pioneer new markets by promoting research and development, and fostering technological innovation. 4. Citizenship As a global player, contribute to the development of communities and society as a whole. 5. Ethics and Compliance In all endeavors, conduct ourselves in compliance with applicable laws and high ethical standards. 6. Environment Respect nature, and strive to protect and improve the global environment. 7. Growth Assure fair earnings to build a foundation for future growth. The Mitsubishi Electric Group's corporate statement, "Changes for the Better," represents our goal and attitude to always strive to achieve "something better," as we continue to change and grow. It is a statement that promises "to create an ever better tomorrow" to our customers by the initiative of each and every one of our employees, who seek to improve themselves by aiming for "the better," and daily aim to "improve technologies, services, and creativity," as stated in our corporate philosophy. 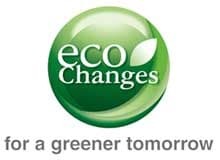 Eco Changes is the Mitsubishi Electric Group's environmental statement, and expresses the Group's stance on environmental management. Through a wide range of businesses for homes, offices, factories, infrastructure and even outer space, we are helping contribute to the realization of a sustainable society. In line with the Mitsubishi Electric Group's corporate statement, "Changes for the Better," which reflects our drive to always seek improvement and make changes accordingly, Eco Changes represents our efforts to work together with our customers to change the global environment for the better. Determining how to build a sustainable society with issues such as global warming, resource depletion and energy challenges in mind is a high priority. As a company, we pursue a balance of a comfortable society for people and an environmentally responsible modern civilization based on contributions to environmental concern and steady improvement. Eco Changes does not represent mere words or image-building; rather, through its business activities, the Mitsubishi Electric Group will enact Eco Changes around the world in pursuit of environmental consideration and environmental contribution that are grounded in reality. Eco Changes was announced in June 2009 in Japan, in June 2010 overseas and in April 2012 in China.